An upright shrub with large cone-shaped white flowers that quickly turn pink. Fall flower color is dark rosy-pink. 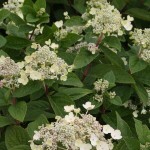 It flowers about a month earlier than other Hydrangea paniculata varieties. It may be grown in a tree form and shrub form. It thrives in sun to part shade in a moist, well-drained soil. The blooms may be dried or used fresh in floral work. PP 16,812.